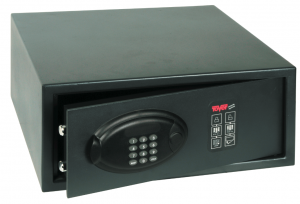 We offer a range of electronic or digital keyboards to guarantee that your belongings are stored safely. • Domestic or hotel use. • Protection of the box with heavy-duty paint. 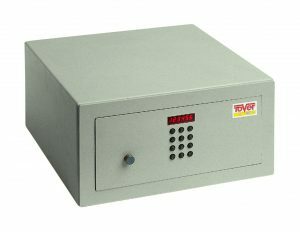 • Security safe with 2 steel bolts of Ø 18 mm. • Automatic opening and closing by motor. • Fixing holes in base and back part. • Variable length code from 1 to 6 digits. • Master-code programmable from 1 to 10 digits. • Lock blocked after 3 failed attempts. • Finish: gray enamelled (EG). • Invisible display that allows to see the pressed code. • Option to print the audit form the safe. • External power source option. • Finish: black textured (NT). 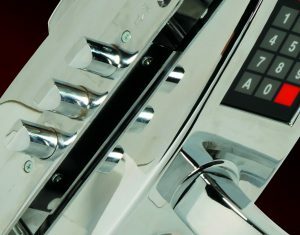 Here you will find closing solutions and access control systems. TOVER creates new designs every year and perfects its products constantly. This work is carried out in the different development departments and new technologies where our resistance tests are executed with the best materials to offer the greatest possible security. The continuous creation of new designs is the way to improve the quality of each of our products.